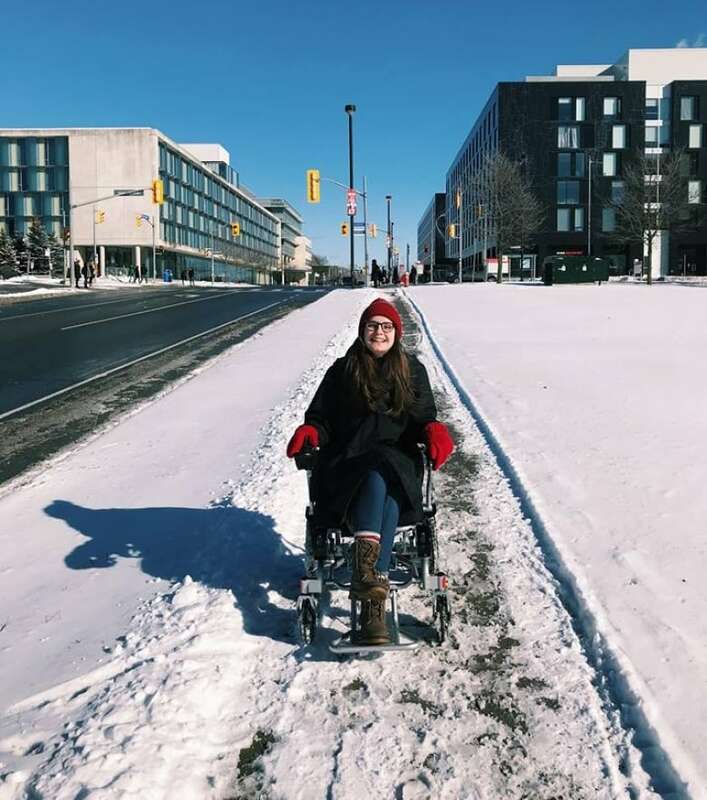 Ali Imrie posted a video to Twitter showing her friend struggling to push her wheelchair along a snow-covered sidewalk on the York University campus. The school says it plans to "do better" when it comes to snow clearing. Ali Imrie says it's only 500 metres from her student apartment to Osgoode Hall Law School on the York University campus in Toronto, but even so, she wasn't able to make it to all her classes this week due to uncleared snow. "Honestly, this week hasn't been any different than any other week in the snow," she said. But this time, she took a video and posted it on Twitter. The 17-second clip posted Thursday evening shows a friend struggling to push her home from class along a snowy path. At one point, they appear to get stuck. Within a day, the post garnered over 20,000 views and was shared almost 500 times. The video is raising the issue of a lack of accessibility for students with mobility issues during weather events like the snowstorm the Toronto area experienced this week. Imrie is quick to note she understands it is difficult to keep pathways clear with the "crazy amounts of snow" that fell, but she is frustrated at what she believes is a lack of initiative from the school to keep on top of snow clearing. Barbara Joy, the spokesperson for York, told CBC Toronto Friday the university has reached out to Imrie and has since done checks to ensure all paths on campus are clear. The specific path in Imrie's video, Joy said, "was actually cleared several times since the snow began, but unfortunately it wasn't adequate." This is her third year using a wheelchair since being diagnosed with myalgic encephalomyelitis, also known as chronic fatigue syndrome, and her second year living on campus as a part-time law student. When she first arrived, her mobility issues made it "difficult and isolating," she said. "It got to the point, last January, where I had a rotating schedule of which friend could meet me before or after class to help me get there," she told CBC Toronto. She says she contacted the school about it repeatedly, but the problem of uncleared snow persisted. "The reaction will be reactive and in the moment — it's fixed. But given it's been a year and I keep needing to bring it up every time it snows, what's missing is the proactive piece. There's not really been any lasting change." Imrie says she understands York 'is a really big campus and it’s difficult to keep it clear all the time,' but she hopes the university can be more proactive in making sure paths remain clear. Joy admits York needs to "do better." One thing she says the university will do is ensure employees perform more checks to make sure all pathways remain clear. "With storms, there is blowing snow and other things that impact the way the path is covered in snow, so even if it was cleared in the morning, doesn't mean we shouldn't check it in the afternoon," she said. "We are going to keep on top of it to make sure it's maintained." Joy also points out there is a shuttle that's offered to students with mobility issues. But Imrie says the shuttle can take up to an hour to arrive after being booked. "For me, because (my illness) is so fatiguing, if I'm in a three-hour class, I can't add another hour on either end to wait for a van." Joy says the school is looking into ways the shuttle can accommodate her better. Imrie, meanwhile, has another suggestion. 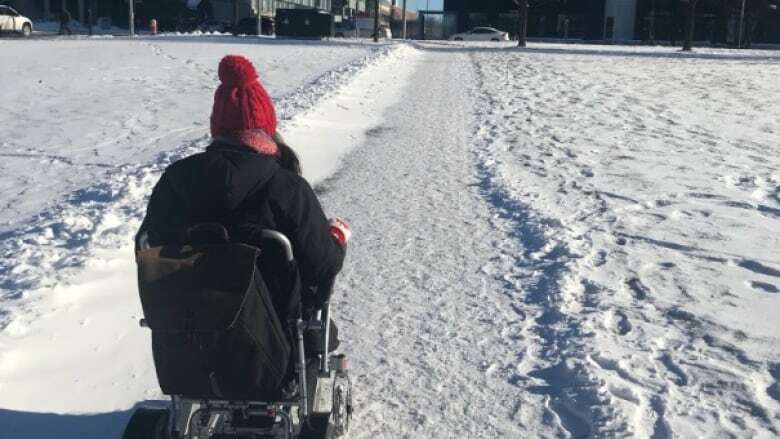 While it would be ideal to have the paths clear at all times, she says the ones heavily used by students with mobility issues should perhaps get priority when it comes to snow clearing. "There's different implications for me versus someone who's walking." She says it's rarely cleared after a snowstorm.